I’m finally getting a chance to continue with my story of how we ended up doing homeschool away from home. Click here if you want to get caught up. We picked out the only stretch of time we could get away without interfering with too many other activities. We planned a four-day drive to Florida with stops in several major cities and a two-day drive home. We would be gone almost three weeks. But just a week or so after we had made all of our plans, CapableDad found out he needed to meet a client in China. His trip would cut into the first part of our vacation. We had two options. We could cancel, which seemed most logical. It was a pretty crazy idea to drive 23 hours across the country with four children, especially a four-month-old who still was rarely sleeping more than three hours straight at night. Our other option was to push back our departure by a few days and leave as soon as CapableDad got home from his 11 days in China. As soon as he got off his 12-hour plane ride. When he was completely jet-lagged. We got together with our small group right after we heard the news about his China trip. I remember saying that if we had to cancel the trip or push it back, I just wanted to know there was a reason. I just wanted to feel like God cared about it. That it wasn’t just our stinky bad luck. Finally, we went with Plan B. Because that seemed the rational choice, right? Get in the car and drive for four days, departing an hour after my husband’s plane landed? It usually takes him a week to recover from a China trip, so I couldn’t imagine how he was going to survive the next four days on the road. Since he had been gone for 11 days, I also was exhausted. I had been scrambling to get everything ready to go, including all of our homeschool work for the next few weeks. And the day before we left, our family got pink eye, and I decided I should wash every sheet, towel and blanket in our house before leaving. CapableDad got home from the airport around 3 p.m. and by 4 p.m., we were ready to go. We drove five hours the first night to Louisville, Ky. The next day, we drove to Nashville and then to Atlanta. We spent the next two nights in Orlando before driving four more hours to southwest Florida. As we were driving all of those days, we kept listening to weather reports about the storms that were hammering Georgia and Florida. IF we had left two or three days earlier, as WE had planned, we would have been driving right through those storms. And IF we had left when WE had planned, we would have spent our one full day in Orlando sitting in our hotel watching the rain. IF we had departed when WE had planned, we wouldn’t have been able to spend an afternoon sitting around the pool in Orlando with CapableDad’s parents who just happened to be at a conference the same day we were there. 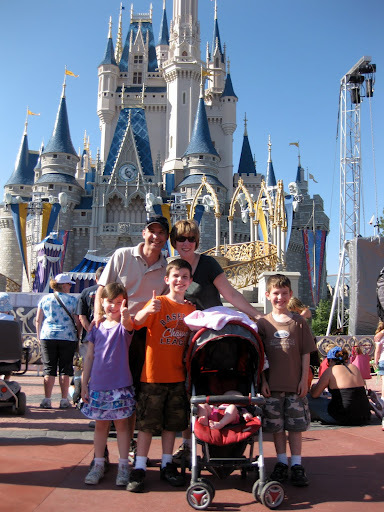 And IF we had departed when WE had planned, we also would not have been able to meet up with good friends, who just by chance were spending a week at Disney World. Because we left a few days later, we had perfect weather and an awesome time together at the park. We also were able to meet up with a friend who works for Disney and got three of us into the park for free. After we made our original plans, our friends who own the house where we would stay also asked us if we would be able to drive an extra van of theirs to Florida. Because CapableDad travels so much, we were able to get one-way plane tickets home for free. This was an amazing blessing for two reasons. First, their van is actually a lot more reliable than ours. Second, while in Florida, we heard about massive flooding in the Nashville area that actually destroyed that beautiful Opryland hotel we visited on the way down. Since we were flying home, we didn’t have to worry about running into any trouble along the highway due to the flooding. We have been amazed at how everything worked out. And I have been so thankful to see so many reasons that our trip really DID need to be delayed. In the end, it was all perfect timing. God's timing is always perfect! Great reminder. I'm almost without words. You have been so very blessed in so many ways.